In this tutorial I will show you how to update your cam oil line to cam housing adaptors. I’ll leave the engineering component to others, but I will offer some questions/thoughts to conclude this tutorial. I realize, because of adaptor oil orifice size, and that the replacement adaptors are considerably smaller, one has little choice but to; (1) place their faith and trust in the engineers who designed our cars, or (2) opt to leave the old adaptors installed. Yes, they’re steel, so don’t be alarmed when you discover this. NOTE: Carrera Tensioner kits come with aluminum sealing washers for this application, which you will probably find on your car during disassembly, as I did. Next, we need a victim, aka subject. 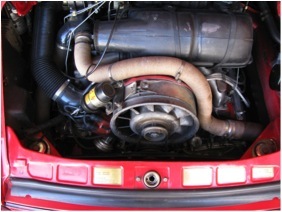 In this case that will be my 1982 911 SC fitted with its 204K mile, original engine that has not been rebuilt or had a top end job. …and the right side adaptor. 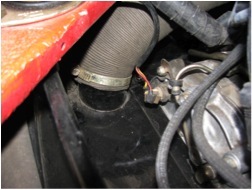 NOTE: Having fitted A/C will complicate access to the right side adaptor, and will probably require compressor and compressor platform removal (leave the refrigerant hoses intact and lay the compressor on to a thick pad, folded blanket, or similar on the right quarter panel. 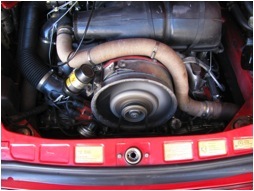 Having a smog pump will complicate the left side, although this ceased to be an issue beginning with 1980 production. Other factors may also affect how easy, or difficult, your task will be. My first step is to do the right (easy) side. 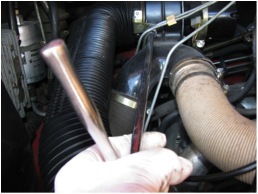 I use the box end of a 17mm wrench to loosen the hollow bolt. 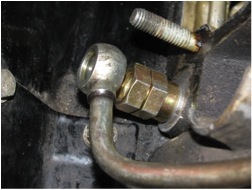 Unscrew the bolt completely and set it aside with its washers. 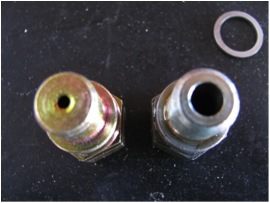 Occasionally, when the hollow bolt is turned, the old adaptor will also turn. 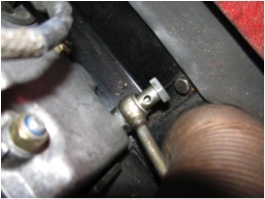 If this happens you will usually have to remove the upper rocker cover in order to hold the adaptor with one wrench while loosening the hollow bolt with another. NOTE: As you remove the old adaptor concentrate on the cam oil line. If the cam housing end of the line rotates easily inside the swedge/pressure fitting at the central hose section, but is not yet leaking, I highly recommend that you be pro-active and replace the line at this point. If the line connection is tight leave the line alone, and be careful to not turn it. This will make the procedure more difficult but you don’t want to disturb the line to hose connection. Remove the old adaptor and compare its orifice to that in the new adaptor. Amazing, huh? After cleaning the sealing surface on the cam housing, be careful to not push any crud into the cam housing, install a new adaptor, by hand, with a new sealing washer. 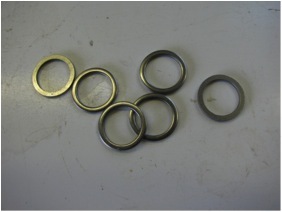 NOTE: Look at those sealing washers. Notice how one side is slightly rounded and the other side is perfectly flat? I put the rounded side against the part that turns, so that the flat side fits against the fixed part. NOTE: Be very careful during adaptor installation! I have it on good authority that those parts are shipped in a box, and they are not individually wrapped. That means that the threads can contact, and be damaged by, other parts. You must examine every adaptor and be sure that the threads are good enough to be able to start the part by hand, and turn it in using very light pressure with a wrench. If the threads are damaged you can; (1) attempt to correct the damage with a thread file or die, or (2) return the part to your supplier for exchange. OK, install the new adaptor. A mirror helps identify if you have dropped the sealing washer. 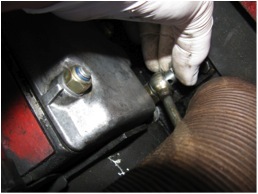 Carefully place the end of the cam oil line over the tightened adaptor, and install the original hollow bolt with two new seals. …but I’m sure that your creativity will win out and come up with something that will work). 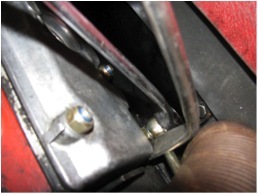 The reason for this step is because the oil line will almost always “follow” the hollow bolt as you tighten it. 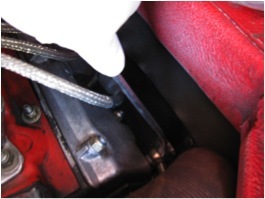 You want the line to not move so that at the next scheduled valve adjustment you’ll be able to remove the rocker cover without loosening the oil line. Tricks, baby, tricks. Time to move to the left side. The following instructions apply to cars built from 1975 to 1983. Earlier or later cars will require a different, but simpler, strategy. 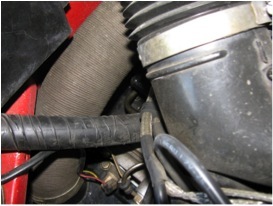 Remove the large diameter, black plastic air hose. 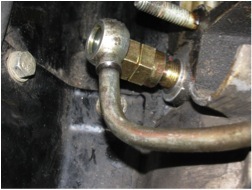 Your hose will have either; (1) a clamp at each end, or (2) a clamp at the bottom and a 6mm (10mm wrench size) bolt that secures the top bracket. 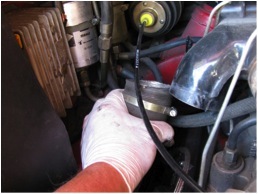 …and pull it up and away, while gently turning it, to loosen its lower connection. 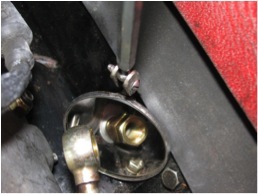 Remove the hollow bolt, with seals, and set it aside. Remove the old adaptor and clean the seal surface. I decided, because my cam oil line did not provide enough movement (it was nice and tight and I didn’t want to risk its end turning at its hose connection), to remove the intake rocker cover. That gave me sufficient space to install the new adaptor by squeezing it between the oil line and cam housing. 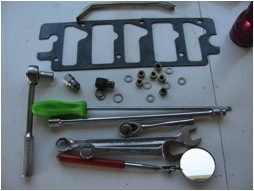 For reference, the tools and supplies that I needed for the job are pictured below. My A/C has been removed, neither of my cam oil lines was seeping/loose, and both hollow bolts came loose without the old adaptors turning, so my entire job took about 45 minutes. Your car may be as straight forward as mine, but it might be far more difficult to do this modification. When I finished the project I started the car. No leaks, drips or errors! …and after about six minutes was about 2.8 BAR. What was truly amazing was the discovery that I, for the first time ever, had idle oil pressure, about 0.8 BAR, at 190F + oil temperature! Am I sold on this modification? The original cams in my car lasted 192,000 miles, and I replaced them with new, original units. I realize that my rod bearings have more than 200,000 miles of wear, as do all of the other internal moving parts, except for the cams, rockers and tensioners, so an increase in oil pressure sure can’t hurt. 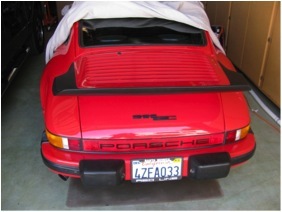 I plan to drive the car from time to time in 100F + heat this summer, so we shall see. 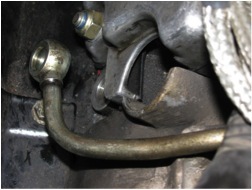 Concerning the modification; variables must exist, and were dealt with, regarding the new oil line adaptors. With luck an engineer or hydraulics expert with the necessary experience will comment on the following questions. 1. Why does the modification work? 2. Does fluid viscosity (oil, water, etc.) affect the pressure/volume of fluid moving through the smaller orifice compared to the larger one. 3. Does the length of the orifice affect pressure/volume of oil flow? 4. Does the finish (smooth vs rough) of the orifice wall affect pressure/volume of oil flow? 5. Does the smaller orifice accelerate oil flow into the cam housing? 6. Because of the increase in “line” oil pressure, in this case the entire engine’s oiling system, would a benefit be realized by switching from the traditional summer weight oil, 20W/50, to a lighter weight oil such as 10W/40, or even 0W/40? Such a change would also introduce another dilemma, switching to a semi-synthetic or full synthetic oil. Obviously, the above questions are me musing, but I think that they warrant discussion. For now, I’m delighted with the oil pressure increase, and the extra protection that it might provide to the rod bearings. 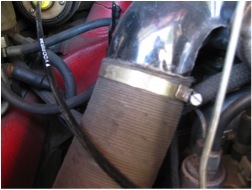 Another benefit of this modification, one I have not heard discussed, is the possibility of lower oil temperature. 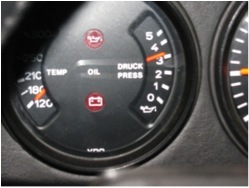 Assume that pre-mod oil pressure is truly zero at idle; and generally lower across the board. 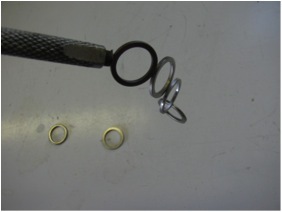 Enter piston oil squirters, used since December, 1970 production, that are special valves installed into the engine case, and designed to open between 42-56 psi (3-4 BAR). Those squirters reduce the temperature of the head of each piston by about 120F. 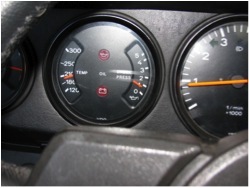 Now, if a pre-mod engine reaches 220F+ during driving; and the oil pressure is somewhere between 2.5 and 2.8 BAR at cruising rpm, a vicious cycle can begin. 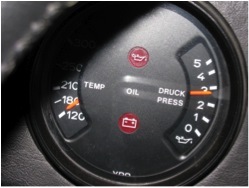 The more that the temperature increases, the lower goes the oil pressure as the oil thins, so a system designed to help the engine stay cool can’t. 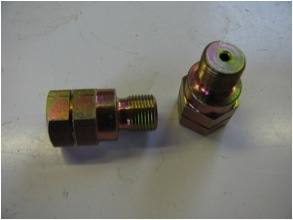 Enter small orifice oil line adaptors. Suppose that at 220F the increase in oil pressure caused by those adaptors pushes engine oil pressure up into the 3.0 – 3.6 BAR range. Now we have a totally different situation, with open piston squirters helping to control, possibly reduce, internal temperatures. So, is the real reason for the change to the adaptors to increase across the board oil pressure enough to get those piston squirters open more often, and longer, with the result being lower operating temperatures of the engine oil? Engineering balance; once again it seems that Porsche has achieved that magical balance between the means and the end. 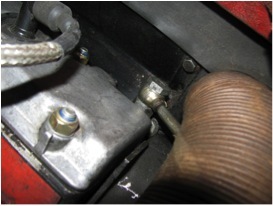 Smaller ports in two relatively simple-to-replace oil line adaptors has seemingly; (1) increased oil pressure/flow to the rod bearings at idle, and (2) possibly increased running oil pressure enough to keep the piston oil squirters open longer to reduce operating oil temperature. In my book that’s a win/win.